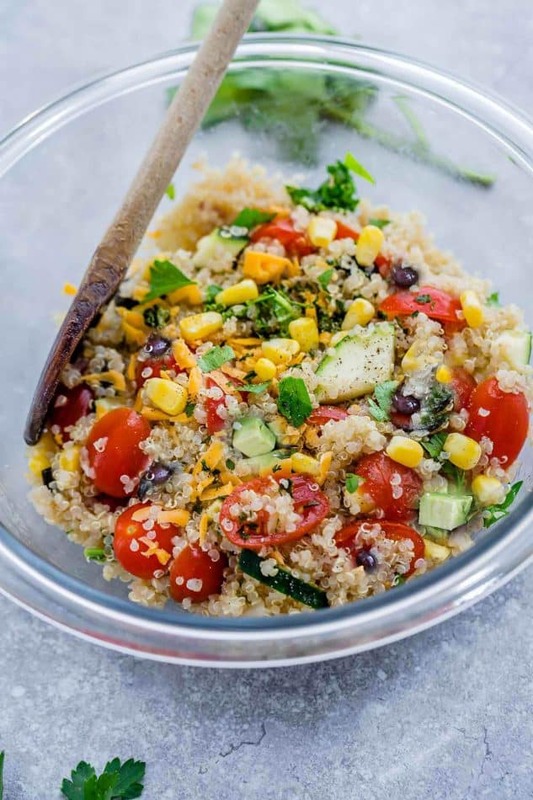 Mexican Quinoa Salad with delicious sweet corn and zucchini make the perfect summery meal. Packed with fresh vegetables and tossed in a fresh and flavorful honey lime vinaigrette. Summer is officially here and salads have been happening a lot around here. I am a total salad geek and have one for lunch just about every day. 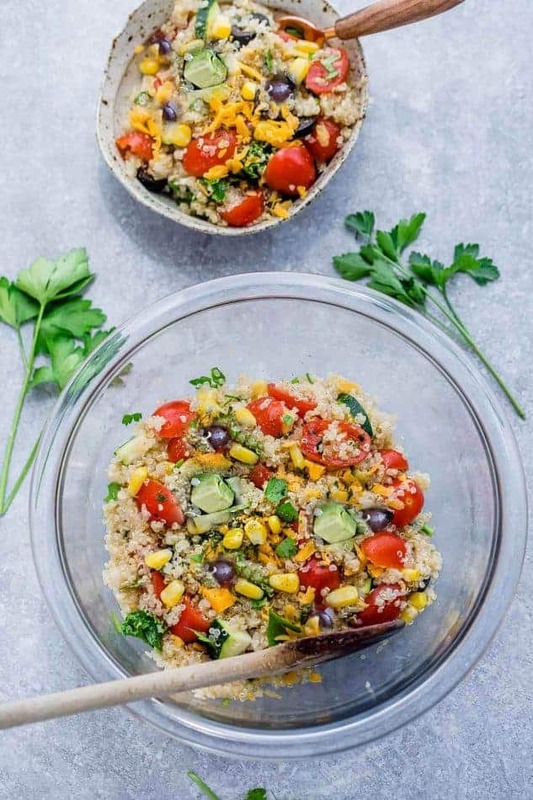 This Mexican Quinoa Salad is super simple and comes together in under 30 minutes – even faster if you have leftover quinoa on hand. I usually make a big batch of quinoa at the beginning of the week and then store it in the fridge. 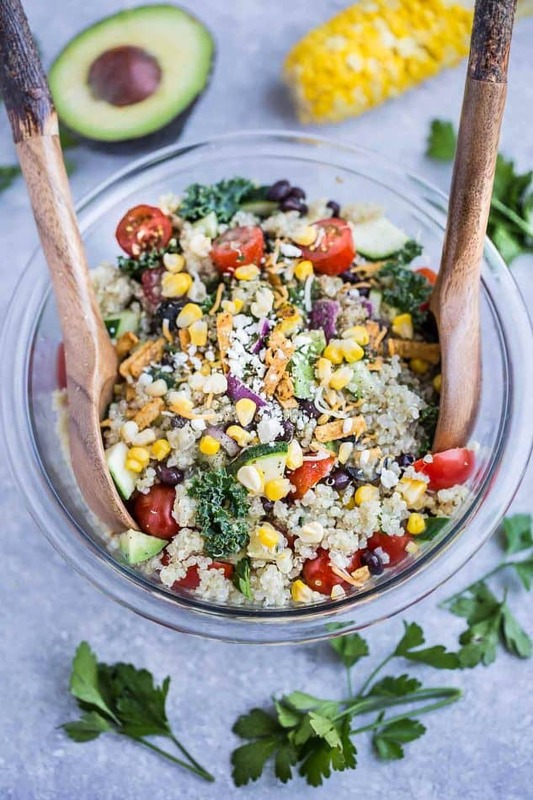 I am still trying to get my husband on board with quinoa and since he loves anything Mexican, I added a few of his favorite flavors into this salad. It’s definitely not authentic by any means but it’s so delicious and perfect if you’re trying to eat a little bit lighter after the holiday. The best part is that you can swap out any of the ingredients for what you have on hand. 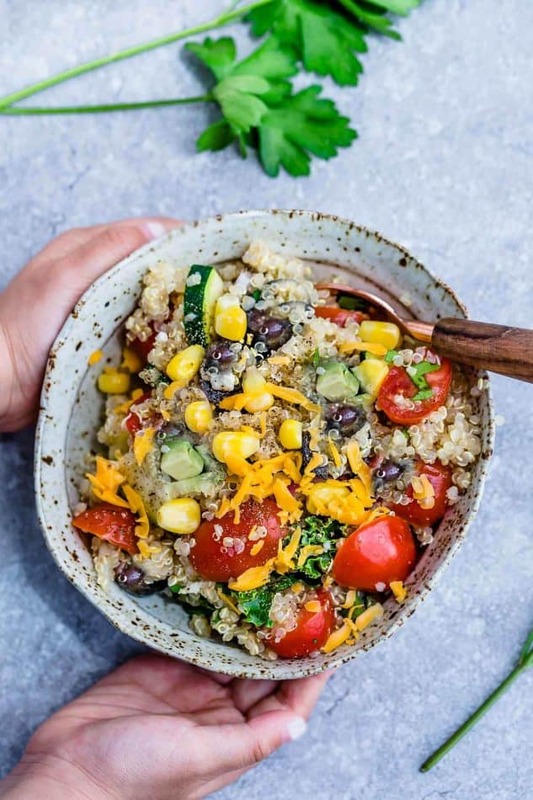 I packed this delicious bowl with some cooked quinoa and a ton of fresh veggies. There’s cherry tomatoes, cucumber, kale, grilled summer corn, red onion, creamy avocado and garden zucchini. There’s also black beans and shredded cheese which help to bulk things up and add an extra layer of flavor. Feel free to leave the cheese out for a vegan version. And then the whole thing is tossed in a refreshing honey-lime vinaigrette. This recipe has the perfect combination of sweet, tangy and bold flavors in every bite. It keeps well in the fridge so you can make it ahead for summer parties or pack it up into separate lunch boxes for work throughout the week. Or you can even add some grilled chicken (or your choice of protein) for a light and satisfying dinner. Add all the vinaigrette ingredients into a jar or a bowl and shake or whisk until combined; set aside. 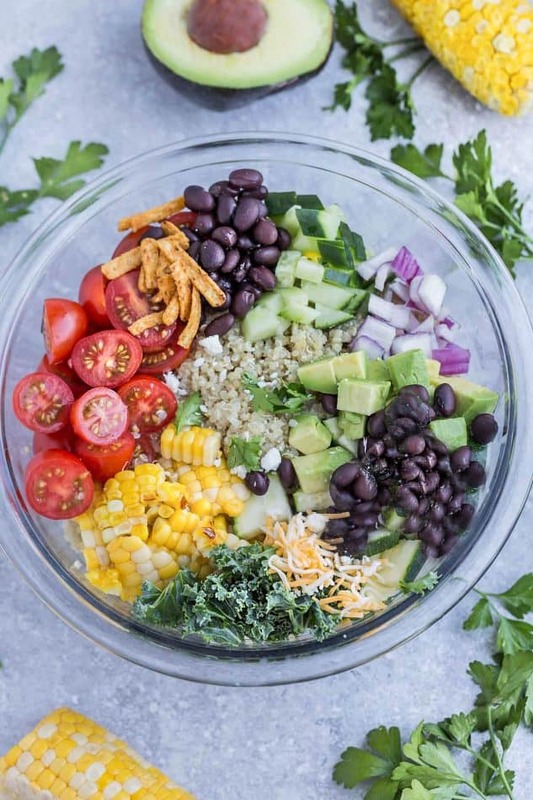 Combine all the ingredients for the salad (minus the toppings) in a large bowl. Pour salad dressing over and toss well to coat. Season with additional salt and pepper to taste. Sprinkle desired toppings and garnish with more fresh cilantro. Serve the salad immediately or cover and store in the fridge until you are ready to enjoy. 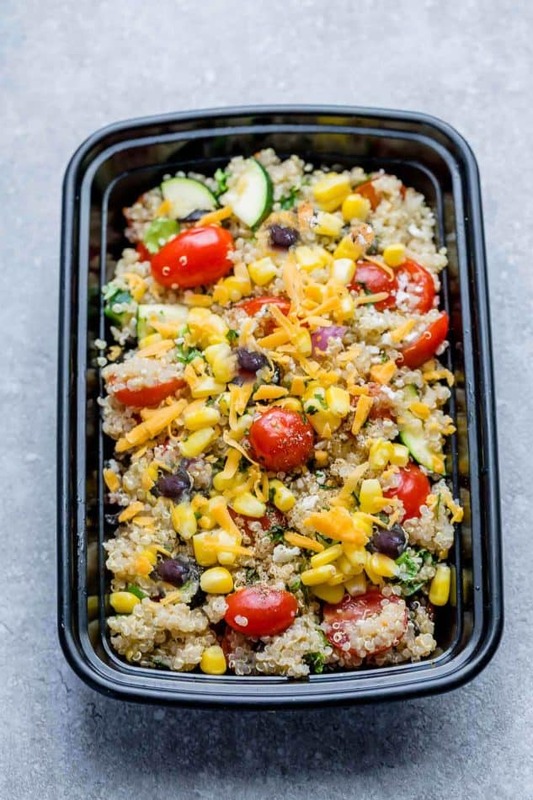 *If you don't have cooked quinoa on hand, prepare uncooked quinoa according to package directions. While the quinoa is cooking, make the vinaigrette and chop all your veggies for the salad.